The Next Generation of Fruit Chews and Tootsie Rolls! 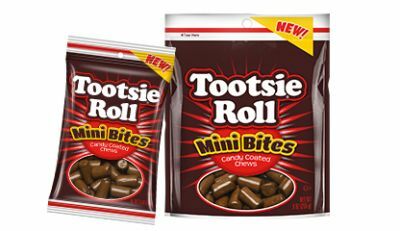 Tootsie Roll Mini Bites is a new way to enjoy Tootsie Rolls! Each Tootsie Roll Mini Bite starts with a delicious chewy Tootsie Roll center, surrounded by a light candy shell. Fruit Chews Mini Bites contain the same Fruit Chews center you know and love, only now with a candy coating. Each unwrapped, ready to eat piece delivers intense fruit flavor, along with a satisfying chew. 5 mouth watering flavors are in each bag: Orange, Lemon, Lime, Cherry and Blue Raspberry! 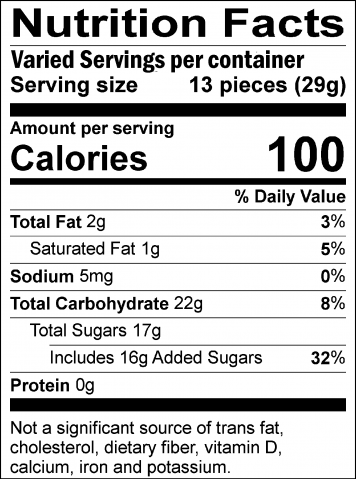 Ingredients: Sugar, Corn Syrup, Anhydrous Dextrose, Palm Oil, Condensed Skim Milk, Cocoa, Gum Arabic, Whey, Confectioner’s Glaze, Soy Lecithin, Tapioca Dextrin, Artificial and Natural Flavors, Titanium Dioxide, Carnauba Wax, Artificial Colors (Including FD&C Yellow 6, Blue 1).